These babies are so wonderfully delicious! Once you make them once, you'll quickly go through the batch and want to make some more! 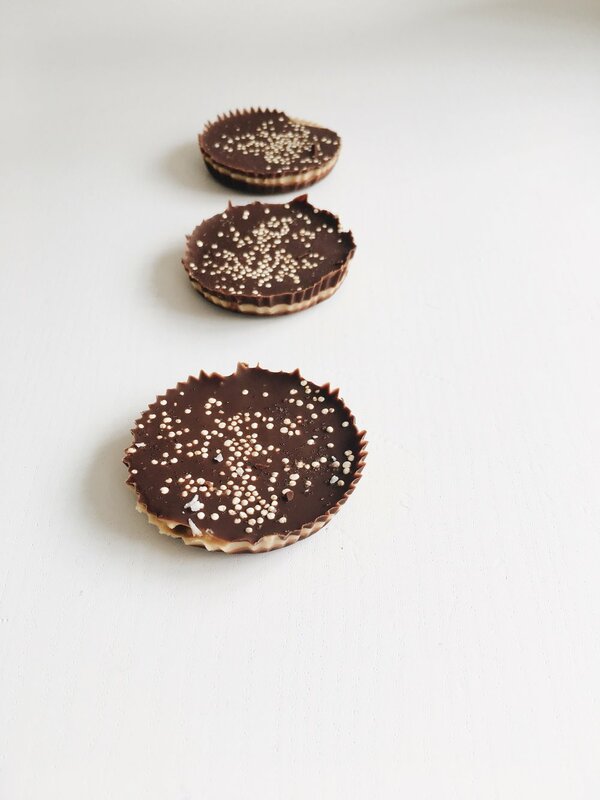 These are inspired by Eating Evolved Coconut Cups and well Reese's Peanut Butter Cups. Reese PB Cups, obviously, because sometimes you just crave a chocolatey PB treat but don't want all the sugar and additives. Eating Evolved Cups, because they provided a healthier alternative to PB Cups and with coconut! A Dark Chocolate Coconut Cup is on its way as well, with no added sugar of any kind and as easy as these little treats. These are pure trial and error, playing around with how much of what worked best. I decided to play around with them, 1. because here in the DK we don't have anything like it and 2. I wanted a treat that didn't have anything extra or unnecessary in them. Lets be honest, homemade is always better. They aren't too complicated to make it just takes a little time with the melting and the freezing, but other than that, it's really not difficult. The quinoa just added a nice little crunch to it and make them look a little more "dressed up" but don't really add any specific taste to them. I store these in Stasher bags in the freezer. They do melt relatively quickly, which is why it's best to keep them in the freezer. Plus, personally, I think it nice to have a chilled treat in that way. But if you're feeling up for it, it really is a fun little treat to make, you know exactly what ingredients are in it and they are a fun treat for all. They have at least, been quite the hit here at home.